Does your home speak Français? French-influenced architecture can be found from coast to coast in the United States, but what defines the French style house? A brief overview of photographic evidence helps us understand the varieties of French-inspired architecture in the U.S.
After World War I, soldiers returning to the United States and Canada brought a keen interest in French housing styles. Building plan books and home magazines began to feature modest homes inspired by French building traditions. Grand homes like the one shown here were constructed with a fanciful mix of French color and details. The Pittock Mansion, built by Oregonian newspaper founder Henry Pittock (1835-1919) in 1914, exemplifies this Franco-American mixture. The original French Renaissance architecture of the 1500s was a mix of Greek, Roman, and Italian stylings. 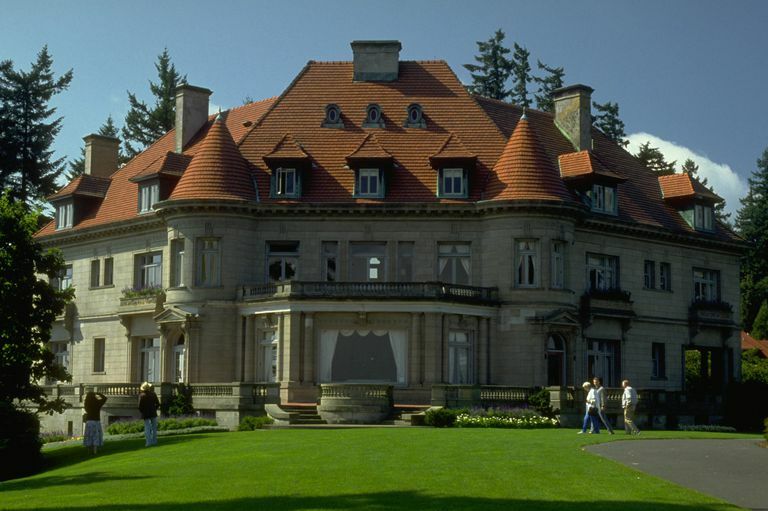 The French Renaissance Revival style of the Pittock Mansion — or any one French-inspired characteristic — exudes elegance, refinement, and wealth. Like the fine wines of France, architecture, too, is often a blend. Designs vary, but French-inspired homes since the 20th century are distinguished by distinctive architectural choices, the most obvious being the hipped roof and the Mansard roof — two of the most engaging roof styles in America. Hip and Mansard-like roofs often have dormer windows or wall dormers that extend through the cornice. To add elegance, the roof eave may be flared or extend well over the outer wall. The siding for the exterior walls is most often brick, stone, or stucco siding. Some French style homes also have decorative half-timbering, round towers at the entryway, and arched doorways. Finally, windows will be multi-paned and abundant to visually offset what is often an enormous, elegant red clay tile or grey slate roofing material. As European countries claimed parts of the New World, France was initially interested in the Mississippi River, from near Canada to Louisiana. French trappers and traders used the river, and France claimed the land west of the Mississippi — territory that became known as the Louisiana Purchase. Acadian practices became Cajun when mixed with the Creole practices after the Haitian rebellion. The French Creole and Cajun houses of colonial America are still tourist attractions in Louisiana and the southern Mississippi. Much of the residential architecture we see today is called French Eclectic — a hybrid of French and American traditions. For centuries, France was a kingdom of many provinces. These individual regions were often so self-contained that isolation created a special culture, including architecture. The French Normandy House style is an example of a specific provincial house style. By definition, the provinces were outside the cities of power and, even today, the word provincial can mean an "unsophisticated" or "unworldly" rural person. French Provincial house styles take this general approach. They tend to be simple, square, and symmetrical. They resemble small manor homes with massive hipped roofs and window shutters or decorative quoins. Frequently, tall second floor windows break through the cornice. French Provincial homes generally do not have towers. American homes are often inspired by designs from more than one area of a country or even more than one country. When architecture derives its style from a broad range of sources, we call it eclectic. French Eclectic Style, circa 1925, Highland Park, Illinois. Normandy, on the English Channel, is a somewhat rural and agricultural area of France. Some French style homes borrow ideas from the Normandy region, where barns were attached to the living quarters. Grain was stored in a central turret or silo. The Norman Cottage is a cozy and romantic style that often features a small round tower topped by a cone-shaped roof. When the tower is more angular, it may be topped by a pyramid-type roof. Other Normandy homes resemble miniature castles with arched doorways set in imposing towers. The steeply pitched hipped roof is common to most French Eclectic American houses built in the early 20th century. Like Tudor style houses, 20th-century French Normandy homes may have decorative half-timbering. Unlike Tudor style homes, however, houses influenced by French styles do not have a dominant front gable. The house shown here is in suburban Illinois, about 25 miles north of Chicago — miles from the Normandy region of France. French Eclectic homes combine a variety of French influences and were popular in American upscale neighborhoods in the early 20th century. Neo-Eclectic, or "new eclectic" home styles, have been popular since the 1970s. Noticeable characteristics include steeply pitched hipped roofs, windows breaking through the roof line, and a pronounced symmetry even in the use of the masonry materials for the facade. The suburban home shown here exemplifies a home inspired by the symmetrical Provincial style. Like French Eclectic houses built much earlier, it is sided in white Austin stone and red brick. Creating American mansions to look like French castles was popular for well-to-do Americans and American institutions between 1880 and 1910. Called Chateauesque, these mansions were not French castles or châteaux, but they were built to be like the real French architecture. The 1895 Charles Gates Dawes House near Chicago, Illinois is a modest example of the Chateauesque style in America. Although much less ornate than many Chateaueque mansions, such as the well-known 1895 Biltmore Estate designed by Richard Morris Hunt, the massive towers create a castle-like effect. Nobel Peace Prize winner and U.S. Vice President Charles G. Dawes lived in the house from 1909 until his death in 1951. The 19th century building boom in the U.S. celebrated, in part, America's close relationship with the French — a true American ally during the American Revolution. The most famous structure to commemorate this friendship is, of course, France's gift of the Statue of Liberty, dedicated in 1886. Public architecture influenced by French designs can be found throughout the U.S. in the 1800s, including the 1895 fire house shown here in New York City. Designed by Philadelphia-born Napoleon LeBrun, the house for Engine Company 31 is but one design by LeBrun & Sons for the N.Y.C. Fire Department. Although not nearly as popular as the New England-born, École des Beaux-Arts educated architect Richard Morris Hunt, the LeBruns continued America's fascination with all things French as first- and second-generation French immigrants — an enchantment that has extended well into 21st century America. The Huguenots were French Protestants living in a 16th century kingdom ruled by Roman Catholicism. French King Louis XIV rejected any notion of the Protestant Reformation, forcing the Huguenots to flee to more religiously tolerant countries. 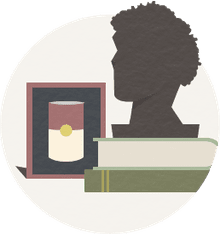 By the time French Huguenots made their way to New York's Hudson River Valley, many families had already experienced Germany, Belgium, and the United Kingdom. In their new settlement near New Paltz, New York, they built simple wooden structures. Those homes were later replaced by the stone houses now seen on Historic Huguenot Street. During the 17th century, the New York territory known as New Amsterdam was a hearty mixture of Dutch and English customs. Stone houses built by the Huguenots combined architectural styles from their native France with styles from the countries of their exile. Even though the Huguenots were French, their colonial houses are often described as characteristically Dutch. The Huguenot settlement in New York was an architectural melting pot.